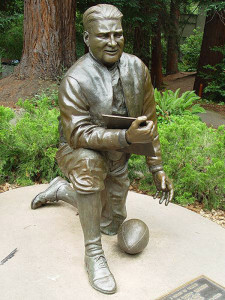 Pappy Waldorf was a famous and well-loved football coach at UC Berkeley from 1947 through 1956. The Pappy’s Boys won 33 consecutive regular season games from 1947 to 1950. This monument to him was commissioned by Pappy’s Boys for the Faculty Glade at UC Berkeley.